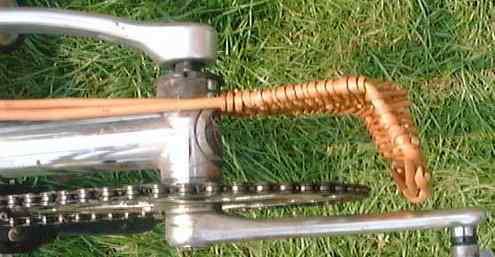 A chainring guard is required for racing with the BHPC if you have an exposed chainring on the front of your bike or trike. Here is a cheap ( ) and light (60g) solution. The guard is shown here mounted on a Pashley PDQ. It will mount on any bike which has something resembling a "normal" bottom bracket at the front. A derailleur post will also not cause a problem. Front view showing how the "tails" go both sides of the "bottom bracket". You can cut off some of the tails if so required to clear other equipment on the front end of the your bike. They are not all required for strength. I'd recommend leaving some attached above and below the bottom bracket. 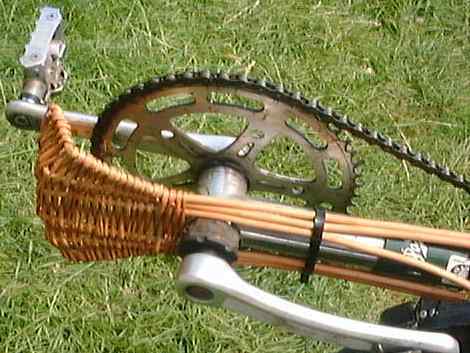 This mounts on the LHS of the bike, and can be kept in place by cable ties or jubilee clips. How you mount it on your bike is up to you, I'm just providing the guard itself. This shows the profile of the guard. The two sets of tails are deliberately left long in order that they can be trimmed by the customer (secateurs are ideal for this). Quite how long you will want them will depend how you mount the guard. It is light - the guard shown here weighs just under 60g according to my kitchen scales, so it shouldn't slow you down up hills. Varnish or paint (I recommend that you either varnish or paint it to make it last longer for outdoor use) will increase the weight a little, chopping off the tails will obviously reduce it. If the guard needs to be changed in shape a little, you will be able to move it around a bit if you soak it in water for about an hour first. Having done this, keep it in the new position until dry. This is a way of bending it to make it clear the chainring more closely or further away, or reshaping the tails etc. 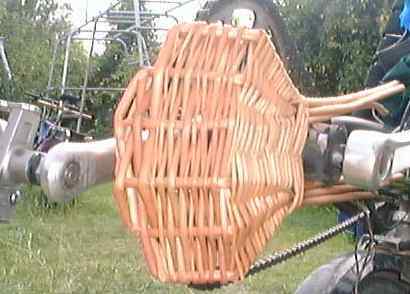 The basket part measures 4.5" long by a maximum of 5" high (as mounted on the bike) by 3" wide (again as mounted on the bike). This is an adequate size to cover chainrings up to 52 teeth or so with reasonable clearance. If you have a slightly larger chainring you will likely be fine sliding it forward a little on your bike. For a much larger chainring, contact me. 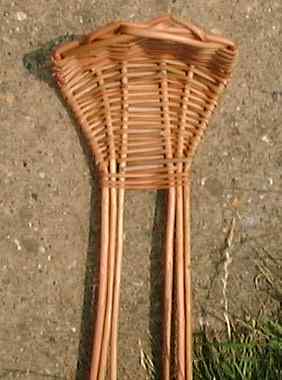 If, having fitted one of these, you think your bike needs something similar on the rear end too, consider getting one of these.